Whistlers were the highlights of 2 recent outings. At this time of year, in their chosen habitats, these two species are often the dominant songsters. The Golden Whistler is common in many of the more open forested areas, but often "encroaches" into denser, wetter, scrubby areas, preferred by the Olive Whistler. On forest edges and along stream sides, the two seem to co-habit quite amicably. 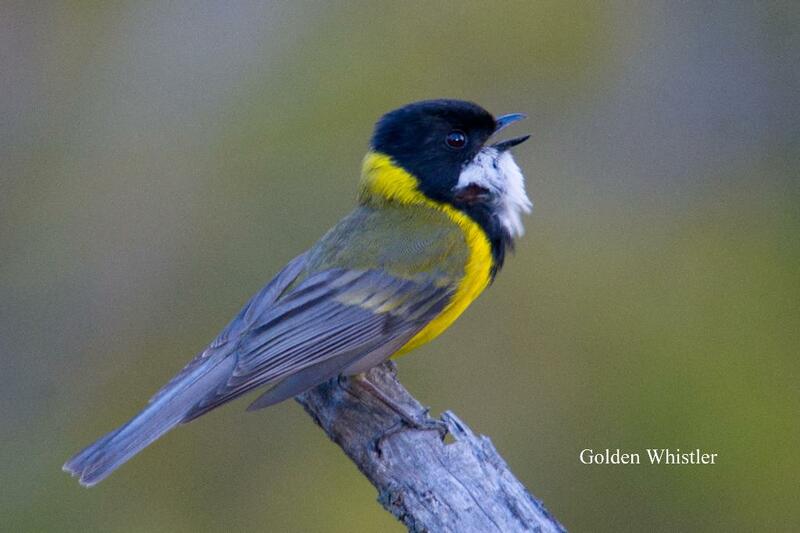 I must have photographed male Golden Whistlers on numerous occasions, but I never knock back the chance to try again. Fortunately they're among the easiest bush birds to photograph at this time of year, calling from favoured perches, and often allowing close approach. Males spend a great deal of time chasing other males while they're establishing their territories. I recently saw 8 males in a melee during an early morning walk in the Risdon Brook Park on Hobart's eastern shore, but once they've established their territories, their 'battles' are limited to calling. I've noted that they frequently react to other birds calling, and seem to try to 'drown' them out, and anyone standing close to a calling male can attest to the strength of the call. Olive Whistlers occupy generally denser, often wetter habitats, commonly along stream sides. Whereas the 'goldens' are extroverts, the olives are generally retiring, callin g from within the vegetation. I did witness, or perhaps more accurately. I heard a vocal duel recently on the edge of the Sandspit River in the Wielangta Forest. Three calling olive males, chased one another among the tea tree thickets, giving me only the occasional glimpse of them. One must have taken pity on me, and stopped for a photo opp., and I scrambled the accompanying shot, taken close to my photographic gear's limits. I have been to this spot along the stream side many times and rarely miss out on recording them, albeit often only from a single call. Golden Whistlers are common here too. 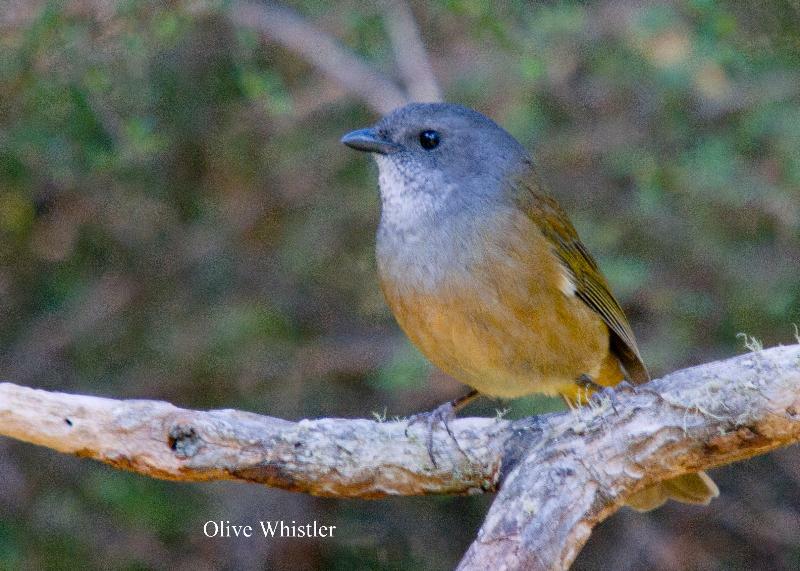 I spent an hour or so in the area, recording, among others, Strong-billed and Yellow-throated Honeyeaters, Pink Robin, Scrubtit and Tasmanian Scrubwren, leaving when the wind rose and finally quietened the whistlers. The Sandspit River track at the northern end has become somewhat overgrown, no doubt due to the rain and lack of use while the road bridge has been closed. The good news is that work is finally being carried out to reconstruct the bridge, the bad news, for me at least, was that I managed to pick up 4 leeches as I pushed my way along the track. I didn't discover this for some hours later and after they had gorged on my blood (top stuff). A reminder to take more precautions next visit.